Thanks, Robert, in Riverside, CA! During an update of my blog, the page formatting for The Sandal Woods Store went haywire. But Robert alerted me to the now-narrower display, which made it difficult to navigate the window. I did some troubleshooting, and found I had overwritten a file with an older version; restoring the file solved the problem. Now everyone can enjoy shopping the SW Store with proper navigation. My apologies to everyone who experienced difficulty while shopping; and my thanks again to Robert, for alerting me of this problem. And always, thanks for supporting my efforts by using The Sandal Woods Store – every purchase made contributes a small amount to my work. Episode 25. Thanks, Christopher Schwarz. Dang. The PS-10 drill-driver quickly becomes the reach-for tool in my shop when I need to drive screws. Following Christopher Schwarz’s glowing review in the Woodworking magazine blog entry of June 25, 2008, I started considering buying and using this tool. Funny – he said the same thing. 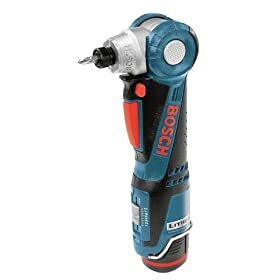 That pretty much explains how I feel about the Bosch PS-10. I am a total convert. NOW this is my primary drill-driver in the shop, and the (very) old and reliable workhorse B&D cordless drill has become the back-up drill, including its three batteries. In this episode I share my enthusiasm for this little jewel of a drill-driver. I also reveal how Sierra’s first little (prototype) stool failed. I made it quickly, using pocket screws, with aprons but not stretchers. I am sure that racking due to the lack of stretchers is what caused failure of one of the legs, after one year in service; Sierra uses a little stool to sit on while taking guitar lessons, and while practicing at home. If you agree or disagree with my diagnosis of the cause or failure, please let me know. I am very interested in following up, and learning what you believe might be the cause of failure after you see the failed leg.